Now watch movies and live streaming YouTube on Android Auto with CarStream in any Vehicle. Ohh my god! When will this tiresome journey end! Even he is not talking! I am now getting bored! How I wish I could just watch some something? But how? This phones’ battery Juice is also less! I don’t want to hold the phone. Wait! Can I watch Movies and YouTube on car dashboard display? YES! I remember I saw this on YouTube. It is pretty simple and easy. Yes, now finally I can access YouTube on Android Auto in the car! If that’s not enough, you can play videos and movies in Android Auto as well. Android Auto takes the features you love about your Android-powered smartphone and puts them directly in your car’s dashboard. Nifty, huh? It displays information on a familiar, easy-to-use interface with cards you can swipe out of the way, legible menus, and large icons. So what are you waiting for? 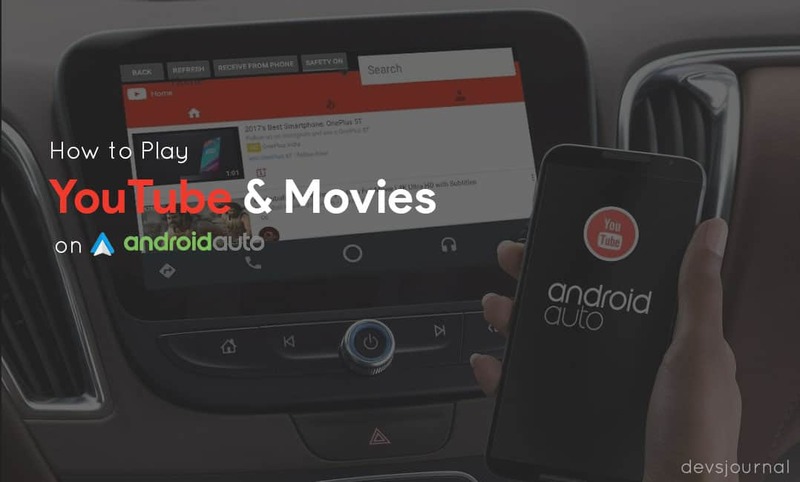 If you too are getting bored sitting next to a boring person or silent driver or even stuck in traffic or even having long road trip, start your Android Auto and stream any movie or content on YouTube without any restrictions! We would require some basic understanding about Android Auto Car Stream. When you have installed Android Car Stream, and you are unable to view it that merely means that the Google is blocking it. However, we have a systematic solution for it. Below are ten simple steps for accessing YouTube for streaming videos and movies to your car dashboard screen. Firstly, you are required to have a rooted phone. If you don’t know how to root a phone, it’s pretty simple. After installing your custom recovery app, you are required to download and install Magisk (you may download it from here) that is one of the safest ways to root your device that would not only allow to root your device but also allow banking and other apps that are blocked on rooted phones. Step 1. Once above apps are installed and the phone is rooted, download and install CarStream. Step 2. Make sure the phone isn’t wired or connected to your dashboard display and then start the App Android Auto and select by clicking on 3 small horizontal lines to left of your phone screen that will open page consisting of following options Settings, About, Apps for Android Auto, Help & Feedback and Exit App. Step 3. Select by clicking on About tab that will display About Android Auto page and select by clicking on its top for approximately 10-12 times. Step 4. This will trigger a dialogue box question to “Accept or Deny”. Click on Accept and on right-hand corner on three vertical dots. A drop-down will be displayed. 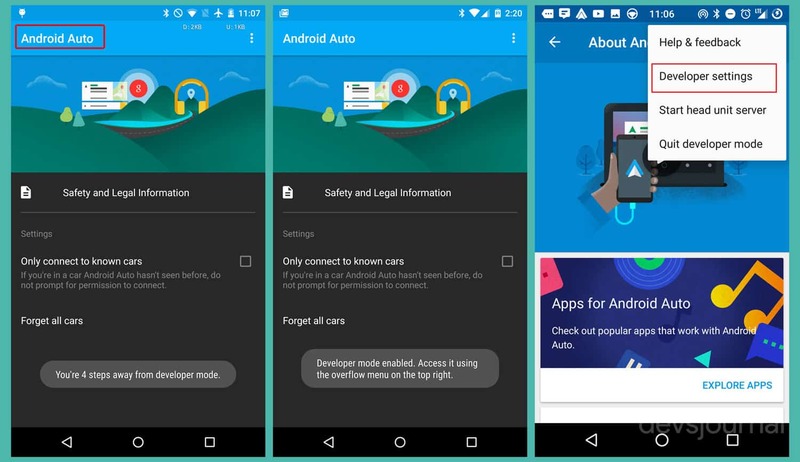 You need to select Developer Settings, and a page of Android Auto would open. Step 5. First, in the list there would be Application Mode, select it. Post clicking a long selections box will open where you need to confirm the last three options are chosen, that are, unknown sources, allow 1080p video output and allow 780p. Step 6. Post this selection; you need to go a step back to three vertical dots tab on top right, then tap it and in the display list select by clicking on “Start Unit Head Server” and then close or exit the app. Step 7. Now connect your phone and dashboard screen with a USB cord, and you will notice that Android Auto-Icon is now getting displayed once the screen’s Home or Meu key is clicked. In case there is any dialogue box asking about permissions for accessing the device or app; you are required to give access by selecting on accept and then disconnect the USB cord. On the screen, it will show, Android Auto Disconnected. Step 8. Now take your phone and after unlocking it, pull the setting screen downwards that would display Android Auto Developer and below it, “Stop” tab. Click on “Stop” and open the app CarStream that you have already Installed. Step 9. Once CarStream app is opened, under its menu, you will see automatically YouTube has opened. Click three vertical dots tab on the top right of YouTube screen, and a drop-down menu will be displayed. You are required to click “Unlock (Root)” that will ask you permissions granting access to root. Press “Grant” when displayed and then restart your phone. Step 10. Wow! You are doing just great! All is set up for the final steps. Now connect your phone and dashboard screen with USB cord and select home button Android Auto Tab is displayed and click it. Step 11. Now, on the dashboard screen, a small speedometer icon or tab will also be seen. When you click it, a warning sign will display for safety. You need to acknowledge it by clicking “I UNDERSTAND THE RISKS” Soon after that multiple options menu will be displayed. Select CarStream option that will be followed by second safety warning sign, “I UNDERSTAND THE RISKS” Once you acknowledge and select by clicking it, a YouTube window will pop-up. Finally, we now have YouTube now streaming on your car dashboard screen with Android Auto supported by CarStream! Start streaming your favorite movies, streams and content with internet from your phone to your dashboard screen. It is advised to use earphones while viewing YouTube from dashboard screen since it may distract the drivers’ attention from driving. Acknowledging “I understand the risks” in step number seven is displayed for this cause. Stay safe!